There’s ben several really major announcements this week showing further tremendous adoption of Bitcoin. MIT student group announces a huge development research project with Bitcoin. The largest Wall Street computer system, Bloomberg Terminal begins to track Bitcoin. Seattle, Washington gets its first Bitcoin ATM machine. 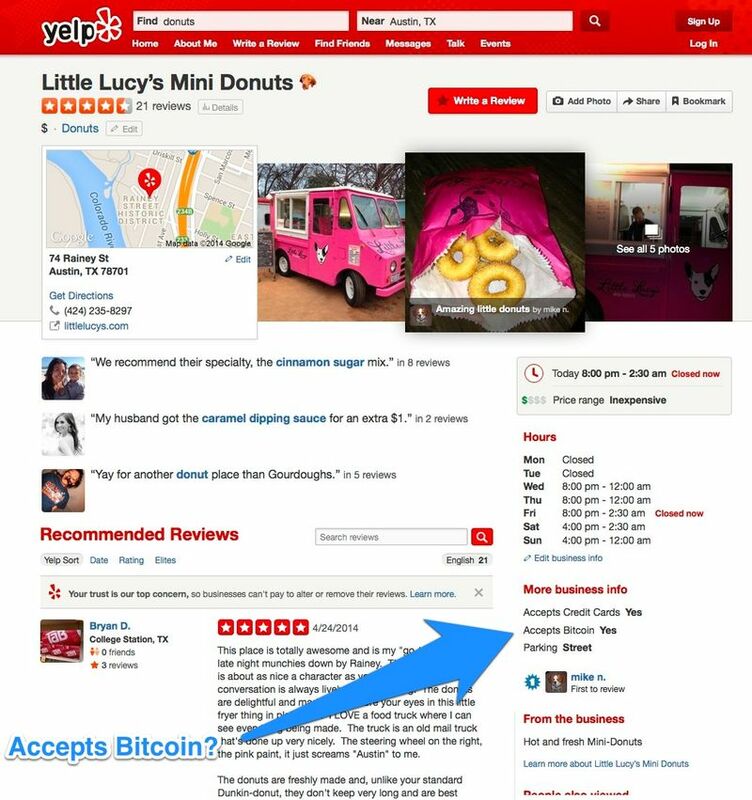 World’s largest review site Yelp added a designation showing which businesses accept Bitcoin. Those who think that it is safer to own dollars than Bitcoin should keep their money in dollars and they can enjoy the safety of losing 5% per year. In the past 12 months, Bitcoin increased in value more than 400% while the dollar decreased in value 5%. The year before that, Bitcoin increased in value 600% while the dollar decreased in value by 5%. The year before that, Bitcoin went up in value 600% while the dollar decreased in value by 4%. How many years will it take for the average person to catch on? Most will wait to buy Bitcoin and wait and wait until the timing is all wrong. Most will think Bitcoin is safe after several more years. Most will buy Bitcoin at its peak, and then they will experience the greatest crash in history. Wired magazine points out in its new article that MtGox suffered from poor management, neglect, and inexperience. MtGox filed or bancruptcy after losing hundreds of millions of dollars of its customers money. Company insiders report that Karpeles was the reason. MtGox was run by computer geeks with little business management experience. Hackers successfully took money several times, perhaps continuously, since June of 2011. When MtGox was offline, Karpeles reportedly spent much time on tasks (such as building a cafe) rather than repairing the MtGox.com website. Karpeles is said to have gained $50 million for himself, but lost it. This is an awesome article about how I lost thousands of dollars due to Mark Karpeles’ major weaknesses. McMillan and Wired Magazine did a great job of getting this valuable inside information on what caused the downfall of the largest Bitcoin exchange. Karpeles must take full responsibility for his failures, and, at the same time, we must understand that much of the value of Bitcoin came from his brave work to provide such an aggressive, robust international exchange. We can only hope and follow-up to ensure that the money is tracked down and recovered as much as possible. One brights side, and one reason why Bitcoin owners like my self have been extraordinarily patient with Karpeles is because much of the money in MtGox was windfall money. Bitcoin is so amazing, that, even if less than 1% is recovered, it can repay us more than we lost if everything is handled correctly by Karpeles and the government of Japan. Mt. Gox is Dead. Amateur Hour is Over. Time to Get Professional. Mt. Gox is dead, and my last comments were overly optimistic and incomplete. I have changed my mind about Mt. Gox now that there is evidence that Mt. Gox may have mishandled and possibly lost hundreds of millions of dollars of Bitcoin. I should have also mentioned earlier that I only trusted Mt. Gox with a small percentage of my own Bitcoin. While it was still being touted as the largest and most trusted exchange, Mt Gox seemed clunky and was having issues for months before I put a comparatively small amount of money into the exchange. Coinbase, on the other hand, was implementing all of the best practices of banks and Paypal, only better. With top advisors of Andreessen Horowitz, Coinbase was obviously more professional, easy to use, and had integration with U.S. banks and credit cards. It was obvious to me that any individual wallet was subject to fraud and attack. Along with Coinbase, I stuck money in many other wallets. That proved to make all of the difference. MtGox has never been worth recommending to U.S. residents as long as I’ve been buying Bitcoin over the past 11 months. The best places to buy Bitcoin in the U.S. are localbitcoins.com (for a more private purchase of Bitcoin) and coinbase.com (for a more U.S. Government-approved purchase of Bitcoin). Buyers, sellers, developers and enthusiasts also get together by way of Meetup.com. Coinbase and Localbitcoins come with their own reliable wallets. Other so far reliable wallets include: Bitcoin QT (Android phone – back it up, and do not lose your phone), Bitcoin QT (Macbook took me a month to install and update for some reason. Maybe it is good that it is fully in sync), Blockchain.info My Wallet, Bitminter (for Bitcoin mining), easywallet.org (no login required, but theoretically less secure), cloudhashing.com (for mining using remote hosting). Coinbase has a simple tool to move Bitcoin to paper. The main lesson is to keep your Bitcoin spread out in many wallets. The old adage holds true with Bitcoin: “Don’t keep all of your eggs in one basket.” Don’t keep all of your Bitcoin in one wallet.